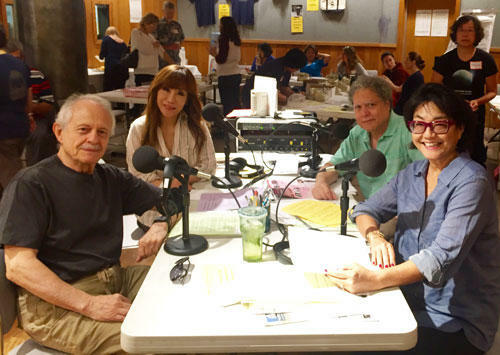 (from l. to r.) Gathered around the table in HPRʻs Atherton Studio "Pledge Central," Hawaiʻi Symphony Orchestra Guest Conductor Jorge Mester, Soprano Sumi Jo, HPR Music Director Gene Schiller, and Arts & Culture Reporter Noe Tanigawa. Titterton continues, "Over the last decade, monies raised through the station's semi-annual pledge drives have made it possible to build a statewide network and develop more locally produced content. The coming year will be an extraordinarily exciting time as much of those efforts will be coming to fruition." HPR gathers 93 percent of the revenue to support its $4.8 million annual operating budget from within the state, through individual members and corporate underwriters. This fall fund drive saw unexpected, last-minute matching gifts by individuals, businesses, and foundations. The station also drew the support of more than 600 volunteers representing a range of Hawaiʻi-based companies, who served on phone banks or as on-air guests. Providing breakfasts, lunches, dinners, and snacks for Celebration 2015 workers were Wanda Adams, Agnes’ Portuguese Bake Shop, Arturo’s Salsa & Chips, Bernadette’s Fine Cuisine, Camille’s Meals on Wheels, Da Spot, Fresh Café, Ginniberries, Grondin, Gyotaku, Honolulu Museum of Art Café, Kan Zaman, Kokua Market, La Tour Café, J.J. Dolan’s, Madeleine McKay, Murphy’s Bar & Grill, Napoleon’s Bakery, Nico’s Pier 38, Proof Public House, Salad Envy, Tacos Zarate, Town Restaurant, Whole Foods Market – Kailua, and Wurst-Wagen Authentic German Grindz.